When I was around 11 years old, I was given a working model steam engine. It had a horizontal nickel boiler, a whistle/release valve and a single cylinder engine. I would fill the boiler, burn some Esbit tablets (hexamine fuel) to get up the steam, open the valve and give the flywheel a spin (in whatever direction was necessary). The engine would open up, sometimes vibrating off the table. It was my first (and maybe last) introduction to thermodynamics and systems theory. There was a power-take-off belt from the main driveshaft leading to a vertical shaft which had suspended from its top a pair of metal spheres. As the engine’s rpms increased, they would spin out until almost horizontal (lesson for a child in centrifugal force). That would depress a needle valve, releasing steam and slowing the engine–a self-regulating device. From then on, I’ve always tried to understand feedback loops and overall system behavior, in whatever the context. 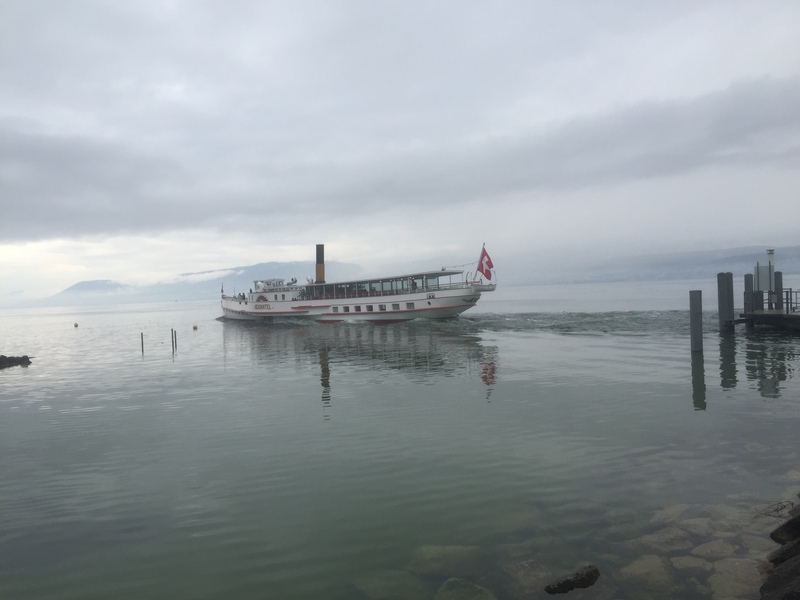 You can imagine my delight when boarding the ferry from Neufchatel to Cudrefin and discovering it was a steam powered side wheeler. It was raining hard all morning so I anticipated a misty crossing, now it seems I was going to be in something like a JMW Turner painting (in fact, the Neufchatel bears a strong resemblance to the steamship in The Fighting Temeraire. The crossing was perfect, mist lifting from a smooth lake. Watching the engineer maneuver the boat to the dock was like watching dance, a careful choreography of levers, wheels, and valves, reversing one side wheel at precise moments, then slowly drifting to the pier. However, the walk out of Cudrefin was unpleasant, 3 km through a muddy swamp swarming with mosquitos. Then we climbed a ridge and, as the sun emerged, looked down on Lake Murtensee. Then a long slipsliding muddy rush down to another lake-end swamp which, thankfully was not swarming as the earlier one had. Arriving in Murten was a treat, with the path following the lakefront, then turning to a walled old-town with those classic Swiss arcades lining a square. We climbed the battlements, learning a bit of the political history and then relaxed in the square, satisfied with another day in the countryside.